From an outsider’s perspective, Sheffield’s charming, hilly landscape seems to possess exactly the kind of rainy-day coziness that would make you want to spend days in your apartment writing indie-pop songs. Yet the city’s own Standard Fare are not a typical bunch of C86-loving, taciturn outsiders; their music burns with a vibrant punk-rock edge, and its uncompromised energy paints the band as likely the most fun-loving people in all of South Yorkshire. 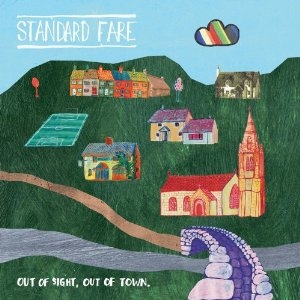 My biggest gripe with the album comes with Standard Fare‘s most straightforward punk-rock moments, including “Bad Temper” and “Call Me Up.” Although both songs are pleasantly animated and cheerful, sounding like England’s response to Cloud Nothings, their melodies come off as rather commonplace. Occasional lackluster stretches appear in other parts of the album, too. Nonetheless, when Standard Fare counter them with a song that sounds like a terrific ska cover of an Ace of Base hit (“Half Sister”), all doubts about their unassuming talent and constantly-growing potential disappear.